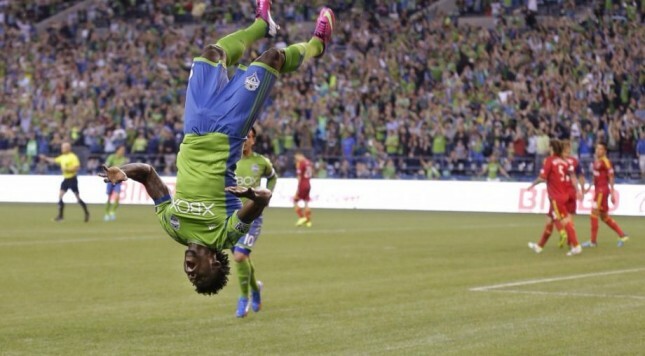 2014 was quite the year in the Emerald City for the Seattle Sounders. It may be hard to believe, but in a season that had the Sounders taking home 2 out of the 3 domestic trophies, Sounders fans were left wondering, “What if?” What if they had scored just one more of the plethora of chances they created in the second leg of the Western Conference Finals? What if Juninho’s goal had bounced in literally any other direction? Etc. etc. The “what if’s” are many, but aside from a minority of Sounders fans, the 2014 season was still a massive success. The Sounders, led by captain Brad Evans (who is playing a new position; more on that later), will look to build on the success they’ve had and hunt down the one domestic trophy that the Sounders have yet to hoist, the MLS Cup. The 2015 offseason have been almost exactly the opposite of the 2014 offseason. 2014 brought a ton of changes, including 4 new additions to the starting XI. This offseason has been very different. There’s been very little turnover on a roster that won the US Open Cup, the Supporter’s Shield, and was a tiebreaker away from playing for the MLS Cup. With the little turnover will come the confidence of having a team that is very familiar with each other. Because MLS is such as it is some roster changes are inevitable. Our very own starlet, our first Homegrown Player, DeAndre Yedlin is off to London for a new adventure with Tottenham Hotspur. While Yedlin will be missed for many reasons, hopefully Tyrone Mears (formerly of Bolton Wanderers) will be able to soften the blow. Mears is essentially a like-for-like replacement for Yedlin. He doesn’t have the pace of Deandre, but he projects to be a better one on one defender. Aside from swapping out Yedlin for Mears, there isn’t really another offseason transaction that expects to impact the starting XI. While the starting XI stays intact mostly, a deep roster got even deeper this off-season. A team that didn’t have very many concerns addressed one of the few concerns they did have: age. Marcus Hahnemann will be replaced as the back up keeper by Troy Perkins. Jimmy Ockford & Damion Lowe will mop up Djimi Traore’s minutes at Centerback. The front office weren’t just trying to fill holes this offseason left by retirements, but they also had #TheFuture in mind. They acquired Cristian Roldan (MID, Washington) via trade in the MLS SuperDraft, while also drafting Andy Craven (FWD, North Carolina) in the later rounds. They signed Victor Mansaray (FWD) & Darwin Jones (W-MID/FWD) as HGPs. And finally, they acquired Columbian U21 international Andres Correa (LB) on a free. Correa adds depth to leftback incase Leo Gonzalez finally has the stepback in his play that many have been expecting to come. ​Oh, defense. The Achilles Heel of a historic 2014 Seattle Sounders team. One would take a quick glance at this defense that started the MLS Defender of the Year, Chad Marshall & all $4 Million of DeAndre Yedlin and think, “What’s the problem?” The problem was goals, and lots of them. In 2015, Chad Marshall and Co. will look to be more efficient in the back. Stefan Frei has his first full season between the pipes under his belt. Frei had his moments of contention early on in the season and became somewhat of a scapegoat for Sounders’ fans. Quietly, Frei had a good second half of the season, and all signs point towards him improving more in 2015. I’ve already covered what Tyrone Mears brings at Right Back in the previous section and Leo Gonzalez might suffer some degrees of setback at Left Back, but I expect him to have another solid season for the Sounders. By far, the most intriguing aspect of the Sounders defense is the Centerback pairing in Chad Marshall and Jack-of-all-trades, recently converted centerback Brad Evans. Brad Evans has spent the offseason learning from and training with his best friend Chad Marshall. Brad Evans, who is naturally a right-footed midfielder, has actually been an above average to good defender for most of his career. During the USMNT’s World Cup Qualifiers and the 2013 Gold Cup, there wasn’t a better RB in the pool of players in the eyes of Jürgen Klinsmann. Entering into this offseason, the Sounders number one concern that needed to be addressed was finding another starting-caliber Centerback to pair with Chad Marshall. I was just as shocked as most when that person was already on the roster in Brad Evans. Granted, things are looking very bright for the Sounders captain at CB, the data sample is still incomplete. Sigi Schimd seems to be confident that Evans can become not just a serviceable Centerback, but also a very good one at that and there’s no reason the Sounders Faithful shouldn’t as well. Should this experiment fail, the Sounders could easily bring in someone during the summer transfer window. With all that to say, this defense is obviously poised to be noticeably better than last season. ​The midfield might be the least attractive part of the Seattle Sounders, but that doesn’t nullify its importance. Sounders fans should expect to see a very similar four-man midfield as the one they saw in 2014, with one exception: Lamar Neagle will be a regular starter, finally. With Brad Evans sliding back to CB, that opens up the right side of the midfield for Neagle to start. Now, for some teams positions mean something, but the Sounders tend to be flexible in their positional tactics. Early last season, Sigi Schmid coined a phrase that describes this tactic and that is, “Ameba Ball.” Neagle & Marco Pappa won’t be playing as traditional wingers, hugging the end lines and pumping in crosses. Sigi allows both players to play within their strengths – Pappa cutting into the middle behind the two forwards and Neagle playing higher up the pitch as a third forward at times. All the while, Gonzalo Pineda & Ozzie Alonso sit deeper as distributers. When looking at the Sounders attack, the focus tends to drift towards the Forwards (more on that in a bit), but the midfield is what makes the wheels spin. The Sounders rely heavily on their midfield to string together a high percentage of passes to unlock defenses. ​Obafemi Martins and Clint Dempsey. Backflips and Captain America. $3 Million a season and $6 Million a season. Any way you put it; these two are the real deal and more-or-less the identity of the Seattle Sounders. This team is very attack oriented, and the attack lives & dies on the shoulders of these two star-DPs. In 2014, Clint & Oba combined for 32 goals and 23 assists. There’s no reason to not expect 15+ goals & 10+ assists type seasons from each of them in 2015. Clint has had his first offseason in almost 2 full seasons, and doesn’t have a World Cup to worry about this summer. Oba is coming off an MVP-like season last year, and doesn’t have all of the contract & transfer rumors floating around like he did last offseason. Sounders fans should expect a lot of fun up top from these two forwards. ​The header says it all. A team that experienced historic levels of success last season have one thing on their minds come December: Winning the franchise’s first MLS Cup. Now, I don’t think that means they’ll sacrifice the US Open Cup or a chance at the Supporters Shield in order to win the MLS Cup, – we all know equations like that have no place in MLS (See: 2014 New York Red Bulls) – but that is what the team must set out to do. From the Owners to newly hired GM Garth Lagerwey down to the newest signee, the team has publically stated that the goal is to win the MLS Cup and that’s what I think they will do. Is 2015 the year they finally become the Bride after years of being a Bridesmaid, or is it just another year for the classic narrative of being full of potential but flaming out of the playoffs? Well, I guess we’ll have to wait and see.